The Buffalo Bills were highly-regarded favorites as they faced the New York Giants in a season-opening game on September 1, 1996. Coached by Marv Levy, who guided the club to four consecutive AFC Championships from 1990 to ’93, the Bills were coming off of a 10-6 record in 1995. They still had their solid, if aging, core on offense of QB Jim Kelly, RB Thurman Thomas, and WR Andre Reed (pictured at right), and hoped to benefit from the arrival of free agent WR Quinn Early. DE Bruce Smith remained the cornerstone of a defense that had returned to form in ‘95 following a down year in 1994. There was some concern regarding Smith, who was involved in a contract dispute and threatened to boycott the game, but he was in the lineup to face the Giants. New York was in its fourth season under Head Coach Dan Reeves and went a miserable 5-11 the previous year. The Giants managed to retain star RB Rodney Hampton, who received an offer sheet from the 49ers in the offseason, but elsewhere there were question marks. QB Dave Brown had failed to develop as hoped and the defense did not look good in a lackluster preseason. There were 74,218 fans in attendance at Giants Stadium in the New Jersey Meadowlands for the Sunday night contest. Following a three-and-out series by the Bills that included two sacks of Jim Kelly and forced the visitors to punt from their own end zone, the Giants started off with good field position at the Buffalo 46 and drove to the game’s first score. Dave Brown completed passes to WR Lawrence Dawsey for 13 yards and FB Charles Way for 12 and Rodney Hampton had a 12-yard run. After gaining a first-and-goal at the five, New York was unable to reach the end zone and settled for a 22-yard Brad Daluiso field goal. The teams traded punts as the game headed into the second quarter, but one of them yielded more points for the Giants when rookie WR Amani Toomer thrilled the crowd as he returned Chris Mohr’s 51-yard kick for a club-record 87-yard touchdown. Daluiso’s PAT made it 10-0. A short possession by the Bills, struggling against a swarming New York defense, ended in yet another punt and the Giants went 57 yards in four plays, the big one a Brown pass to Way for a 37-yard TD. Daluiso converted for a seventeen point advantage, and an upset seemed very possible. Buffalo began to dig out of the 17-0 hole on the next series, helped when Daluiso’s kickoff went out of bounds and thus gave the Bills the ball at their 40, driving 60 yards in nine plays. Kelly completed three straight passes, to TE Lonnie Johnson for three yards, TE Tony Cline for six, and then to Andre Reed for 31 yards to the New York 16. Thurman Thomas ran twice for eight yards before Kelly again connected with Cline, this time for seven yards to the one, and two plays later it was Thomas bulling up the middle for a touchdown. Steve Christie converted to narrow the score to 17-7, which remained the tally at the half. The Giants had the ball first in the third quarter and punted, but got it back on the next play with Kelly’s pass was intercepted by CB Philippi Sparks, who returned it 19 yards to the Buffalo 14. Four plays later Daluiso booted a 34-yard field goal and the lead was extended to 20-7. The Bills responded by advancing 80 yards in 10 plays, the biggest of which were passes by Kelly (pictured at left) to Quinn Early for 39 yards and Reed for 28. Christie’s 28-yard field goal made it a ten-point contest at 20-10. A short series by the Giants ended with a punt and Buffalo, now utilizing its no-huddle offense effectively against a tiring defense, moved quickly to score again. RB Darrick Holmes ran twice for 12 yards before Kelly went for Reed on a slant pattern and the receiver split the secondary and raced for a 60-yard touchdown. Christie again added the PAT and, with 6:30 remaining in the period, the New York lead was narrowed to 20-17. The Giants got an apparent break on the next series when, forced to punt, Buffalo DB Jeff Burris fumbled and LB Corey Widmer recovered for the home team, but they were unable to take advantage and shortly thereafter had to punt again. The teams exchanged punts as the game moved into the fourth quarter until the Bills put together a long drive of 75 yards in 13 plays. Thomas started things off with two runs that covered a total of 13 yards and Kelly connected with Johnson for eight. Three plays later Reed ran for 13 yards on a reverse to get the ball into Buffalo territory but, following a sack of Kelly by LB Corey Miller, the visitors were facing a third-and-18 situation at the New York 45. Kelly completed a pass to Early for 20 yards that kept the drive alive and four plays later Christie kicked a 39-yard field goal that tied the score at 20-20. Neither team was able to score in the remaining minutes of regulation, although a long pass by Brown with 2:56 remaining on the clock barely missed being caught for a sizable gain by WR Thomas Lewis, and the contest headed into overtime. Buffalo had the ball first and punted. The Giants advanced to their 41 on the ensuing possession but Brown fumbled when sacked by Bruce Smith and LB Chris Spielman recovered at the New York 33. The Bills advanced methodically to the 16, with Kelly throwing to Cline for eight yards to convert a third-and-seven play, before Christie came in to kick a 34-yard field goal with 4:52 remaining in the extra period and Buffalo, which had trailed for most of the contest, came away the winner by a final score of 23-20. The Bills led significantly in total yards (410 to 231), first downs (25 to 12), and time of possession (40:30 to 29:38). However, the Giants recorded seven sacks, to five by Buffalo, and the Bills turned the ball over twice, to one suffered by New York, although it led to the decisive score. The teams punted a combined 19 times, with 10 by Mike Horan of the Giants and 9 by Buffalo’s Chris Mohr. 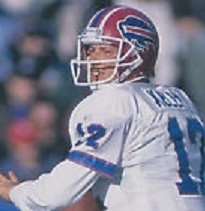 Jim Kelly completed 24 of 41 passes for 313 yards and a touchdown along with an interception. Thurman Thomas rushed for 97 yards on 32 carries that included a TD. 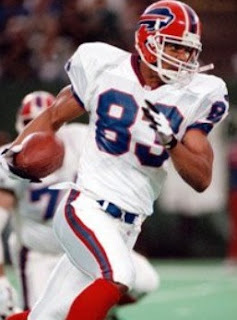 Andre Reed gained 138 yards on his five catches that included a touchdown while Tony Cline and Lonnie Johnson had 6 pass receptions apiece, for 41 and 37 yards, respectively. On defense, Bruce Smith was credited with two sacks, including the one that resulted in the game-deciding turnover. For the Giants, Dave Brown was successful on 11 of 27 throws for 169 yards and a TD with none intercepted. Rodney Hampton led the club with 50 yards on 18 rushing attempts. Charles Way topped the receivers with four catches for 78 yards and a touchdown. Including the 87-yard touchdown, Amani Toomer (pictured at right) had a noteworthy debut with a 28.3-yard average on four punt returns. The Bills got off to a 9-3 start, although initially struggling to put points on the board, but faded down the stretch to finish at 10-6, which placed second in the AFC East and qualified for a Wild Card playoff spot. They lost to the upstart Jacksonville Jaguars in the first round. New York was 0-3 before winning two straight games on the way to a 6-10 record that placed last in the NFC East. Andre Reed’s big opening game heralded a return from an injury-plagued ’95 season as he caught 66 passes for 1036 yards (15.7 avg.) and six touchdowns. Bruce Smith’s two sacks were part of an eventual 13.5 for the year, his best total since 1993, and he was a consensus first-team All-NFL selection for the fourth straight year. 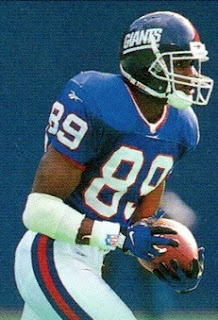 Amani Toomer averaged 16.6 yards on 18 punt returns and returned one more for a touchdown during the season. Primarily a kick returner in his first three seasons, he would move into the starting lineup as a wide receiver and catch 668 passes for 9497 yards (14.7 avg.) and 54 TDs in a 13-year career with the Giants.